The WorldWide Telescope (WWT) is a observable universe visualization software environment that enables your computer to function as a virtual telescope — bringing together imagery from the world’s best ground- and space-based telescopes for the exploration of the universe. 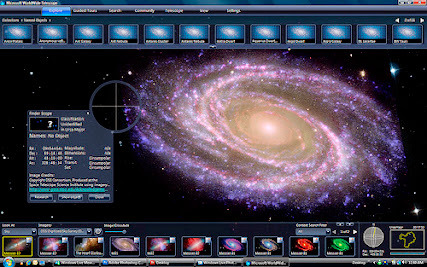 WWT displays the astronomical sky as maps, Milky Way, the 3D Universe, and earth science data right on your computer. WWT represents a major step toward the democratization of science, and it has turned the Internet into "the world’s best telescope" - a veritable supercomputer at your desktop. WorldWide Telescope aggregate scientific data from major telescopes, observatories, and institutions and make temporal and multi-spectral studies available through a single, cohesive Internet–based portal. It blends terabytes of images, information, and stories from multiple sources into a seamless, immersive, rich media experience delivered over the Internet. Images are taken from the Hubble Space Telescope and approximately ten earth-bound telescopes. The data in WWT is presented in a form that facilitates integrative research, thereby helping to bridge the gap between cutting-edge research, education, and public knowledge. Students and user of all ages will feel empowered to explore and understand the cosmos using WWT’s simple and powerful user interface. Utilizing the Microsoft high performance Visual Experience Engine, WorldWide Telescope allows you explore the universe as never before. It enables you to seamlessly pan the sky and to zoom in on celestial features, including stars, nebulae, and planets. You will be able to find several sources at hand, for every object you explore. Microsoft WorldWide Telescope runs under either a Windows or a web client based on Silverlight. The program is designed to scale from web browser to desktop to large multi-channel full dome digital planetarium. 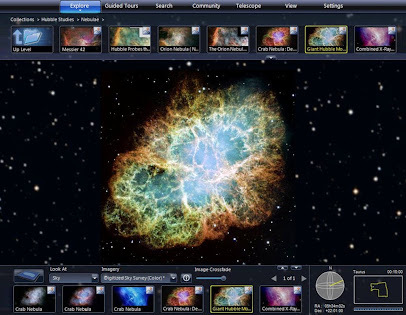 Download free Microsoft WorldWide Telescope 5.0. Microsoft WorldWide Telescope file size 94.9MB.